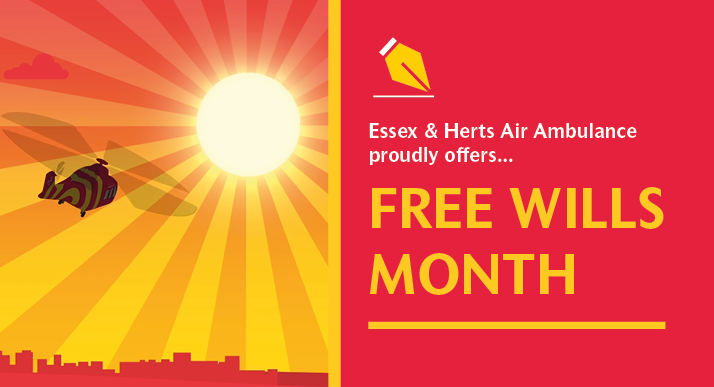 March is Free Wills Month at Essex & Herts Air Ambulance. We are offering people aged 55 or over the opportunity to have a will professionally drawn up by a participating solicitor, who are offering their services free of charge in support of Essex & Herts Air Ambulance. Having a will drawn up ensures that your wishes are respected and allows you to provide for your loved ones. 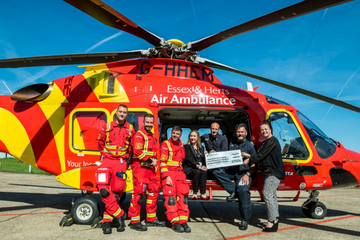 For the first time, solicitors across Essex and Hertfordshire have agreed to waive their usual charges for writing a will for supporters of Essex & Herts Air Ambulance. Simply contact your local participating solicitor by the end of March to arrange your appointment. The number of appointments are limited so please make contact as soon as possible. There is a suggested donation of £100 for a simple will and £150 for a mirror will which will be collected by the solicitor on the day. Will writing services for a single simple will typically cost around £149-£200 + VAT (£178 – £240 including VAT). We appreciate that leaving something to your family will be foremost in your mind when it comes to preparing a will. By participating in Free Wills Month we hope that you will consider leaving a legacy in your will to our Charity, although there is no obligation to do so. 1. Anyone over 55 can contact one of our participating Solicitors from launch of the campaign in February 2019 and must take their appointment during the month of March 2019. 2. A Free Will covers the writing of a Single Simple Will or a pair of Simple Mirror Wills. If your Will is more complicated, then the solicitor will pre-agree the additional fee directly with you. 3. A donation of £100 for a Single Simple Will and £150 for a pair of Simple Mirror Wills is suggested by Essex & Herts Air Ambulance. We will provide donation envelopes for each Solicitor so they can collect this safely and return it to the Charity after the appointment. All donations will be recorded and the individual notified. 4. During your appointment the participating solicitor will help you write a Will that reflects your wishes. There is no obligation to leave a gift to Essex & Herts Air Ambulance. 5. The Essex & Herts Air Ambulance will not receive any information about the contents of your Will or your name/address. 6. There will be a limited number of free appointments with all participating Solicitors and these will be allocated on a first come first serve basis. 7. At the end of your appointment you will be asked if you would be happy to complete an optional feedback form which does not specify your name, but requests information such as your age and where you heard about the campaign. The Solicitor will send this form to Essex & Herts Air Ambulance. If you would like to find out more about leaving a gift in your will, we have two upcoming free to attend information events. 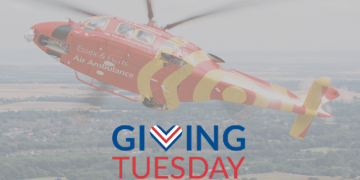 Here you will hear from our legacy expert, local Solicitors and also one of our Critical Care Paramedics, about how supporting our Charity continues to make a difference in the future. If you are interested in attending either of these events then please do contact us and book your space. 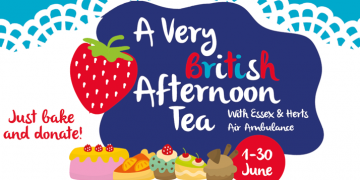 For those local to Essex, you can find more information about the event here. For those local to Hertfordshire, you can find more information about the event here.